Are Mountain Bikes Good in Snow? Are mountain bikes good in snow? If we mean good fun, then hell yeah. If we mean an efficient mode of transport then perhaps not. That being said, you can now buy mountain bikes that are specially adapted to ride in the snow. In 1987 people started to race their mountain bikes in the snow for the first time at Iditabike. The Iditabike was based along a section of the Iditarod dog sled race. This 200 km race can also be charted as the birth point of a new genre within mountain biking, the fat bike. The first race highlighted what mountain bikes needed to be ridden on snow. A wider footprint was needed, this should probably have seemed obvious to anyone who has ever seen a pair of snowshoes. At the time, standard mountain bike tires were narrower than tires today and a lot thinner than fat bike tires. Fat bike tires are anywhere between 3.5” and 5” wide. You’ll find most standard mountain bike tires these days are 2.25” to 2.75” wide. This width is an inch wider than tires were in the 1980s. So we have a bigger footprint than when people originally started riding on snow. You don’t need a fat bike to ride in the snow, though. You can still take your mountain bike out there. 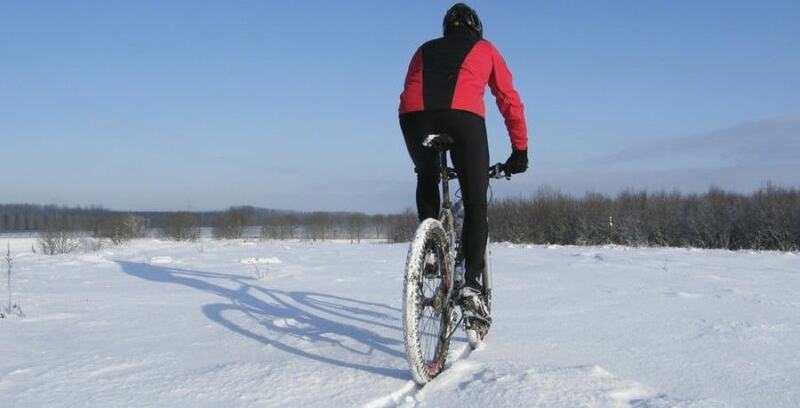 If you want to play in the snow, then so does your mountain bike. If you’re going to go out and ride in snow, you need to be prepared. The first thing to bear in mind is that if there is snow on the ground, it’s probably cold outside. That may seem like an obvious thing to say, but the amount of people I see on trails during winter who have forgotten to dress correctly tells me it isn’t. The best way to be clothed is in layers. Layers make it easy to chop and change clothes when out. If you’re warm you can just shed a layer. When using layers always remember that a layering system only works as well as its weakest layer. If you wear an expensive breathable jacket, a technical base layer, and then run a cheap supermarket t-shirt, you’ve just ruined your layering system. You’ll need good gloves, ideally a pair a little larger than you think. The extra space allows hot air to fill the gap or you can fit a thin liner glove if it’s really cold outside. You will need to be in control of your mountain bike, and you can’t be in control if your fingers are frozen. Frozen fingers mean you won’t be able to pull your brake levers. You’ll also want to wear a hat under your helmet. Helmets are pretty ventilated so don’t get a proper brain freeze. It is incredible how quickly cold air can kill your enthusiasm for a ride. You won’t be able to concentrate on the trail because all you’ll be thinking about is how cold your head is. Make sure you or someone in your group has an emergency kit as well. Falling and breaking something can quickly escalate into a life and death situation if you don’t have the correct equipment. Take something to create a fire, a bivvy bag or emergency blanket, and lights as a minimum. Make sure your cell phone is charged as well. You will also want to think about food. You’ll use way more energy when riding in snow than you will during a day out in summer. Take more than you think you’ll need. It is better to go home with food than to be freezing, miles from anywhere, and wishing you had brought more with you. Your bike will not work the way you expect it should. All parts of your bike can freeze and seize up. If you ride a lot during winter, I’d change your hydraulic brakes for cable brakes. It may also be worth removing your dropper post. It will invariably freeze in its lowest setting. The hydraulic fluid for both your brakes and dropper post is in a thin hose, and it will not take long for the fluid to freeze solid. You’ll also want to shift your gears pretty often. Shifting gears will help to avoid the seizing up of your cassette and mechs. Snow build-up can also cause issues with your rear mech moving when you try to change gears. Regular shifting should help to remove it. Now if you are riding on snow that could be best described as pretty icy, then you will want spikes on your tires. You can buy tires with spikes already fitted or you can fit your own spikes to your existing tires. If you install your own spikes get the threaded style. They’re more expensive and take ages to install, but they’re way better than the push-through style. When out riding, look for snowmobile trails to ride. Snowmobile riders will be going where the good snow is. They will also have created the best surface to ride on: packed snow. Packed snow will be the easiest type of snow to get grip on. Deep fluffy snow looks the best, but it may also be intimidating. That is not a problem as long as it has a base of frozen snow. The best way to ride through deep snow is in a straight line. Taking sharp corners is a great way to get a closely acquainted with the ground. Always ride looking up. Looking up allows you to see where you’re riding. Look out for snow that’s melted and refrozen. Refrozen snow will become very slippery. It’s been polished every time it has thawed and refrozen. You’ll need to think about your riding position. You’ll want a position similar to how you ride when you’re climbing. You need to keep body weight over your back wheel. With your weight over the rear wheel you will be able to find traction. Similar to driving your car, you’ll want to stick to a constant speed. Fast acceleration and braking will cause a skid and ultimately a fall. You’ll also want your speed to be slightly higher than you’d think. By doing so, you will be able to ride through any hidden deep spots of snow. It is all about keeping your momentum going. So, by now, you’ll either be terrified of riding your mountain bike on the snow or itching to do so. Trust us though, riding a mountain bike in snow is great fun. It will help beat the seasonal blues and it’s better than sitting on the sofa watching TV repeats.